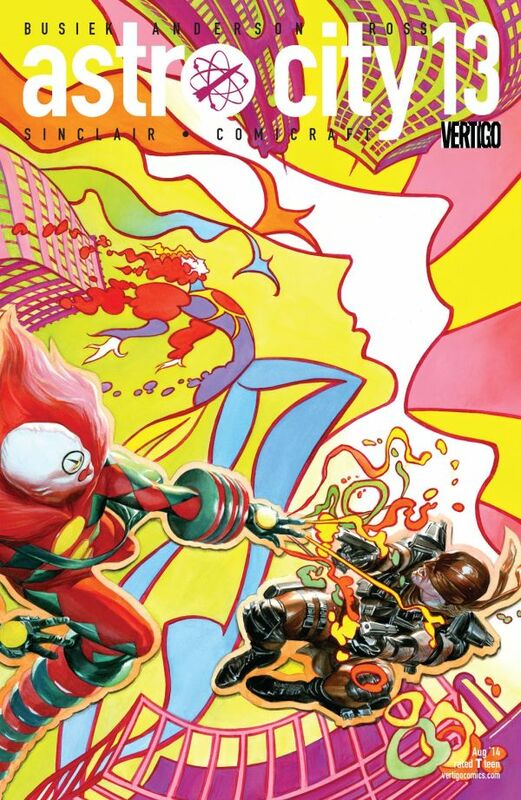 This comic is weird and strange and, unsurprisingly for Astro City, good. I’m glad I read it the way I’m supposed to and the more conventional way as well. There’s a robot dog that is powered by the n-field – the nebulous energy field that powers the mysterious N-Forcer – and that winds up sad, because the music is gone. 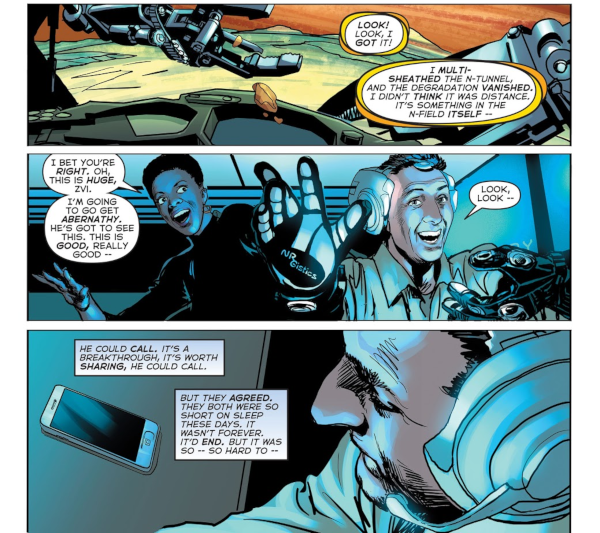 A fixation on music is unusual in a silent medium like comics – when it’s invoked, it’s often noteworthy, like the song Superman sings to power the Miracle Machine in Final Crisis. Since it’s impossible to hear, it speaks of nothing but possibility – any song in a comic could actually be any song. The main characters of this story, affected by “affection affliction” for want of a better term, include a supervillain named Gundog – combining America’s two greatest loves – and a bank teller named Laura, who just wishes something exciting would happen. There’s also a couple of gay scientist boys in love, trying to make a relationship work even though it’s been reduced to notes and texts due to the schedule they keep. All of them are affected by the wave of affection, and the possibly divine being behind it. Wondering if an entity made of love and music means that love and music is a lie is the sort of angsty, possibly-overthinking-it idea that you have to expect in a superhero universe where different cosmologies live on the same street and have to at least respect each other at the neighborhood meetings. 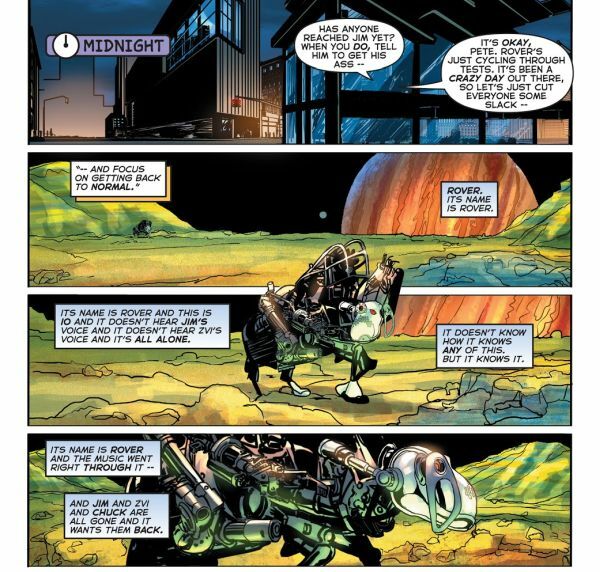 Maybe love is real along many vectors, the way that time travel in the Astro City universe has different approaches and different ways around the Grandfather Paradox. The Dancing Master talks about the Dance, something that touches everyone in the city at 12:00 noon – everyone feels an existing romantic connection deepen, or a new one bloom. The Dancing Master claims that they pushed no one into anything they weren’t inclined towards, but it’s tough to entirely say if they did, and that’s one of the things about godly beings like the Hanged Man and the Dancing Master – if they represent abstract concepts like love and salvation and fear, does that mean that when we feel those things, they don’t entirely belong to us? Few concrete answers abound. And rendered in the usual style of Astro City come the meeting of abstract concepts: the meeting with the Hanged Man. These shifts in art style help denote that the Dancing Master is not from around here, rendered in a pop-art psychedelia style that wouldn’t be out of place on a 60’s album cover. There’s no enough good things I can say about the artwork of this issue. Asides from another handsome Ross cover, there is the impressionistic styles used to denote the Dancing Master – who visits Astro City after a scientific pinhole is pokes into a subatomic realm. Brent Anderson is never bad, but here he is on fire, switching styles on the fly – like this fine line style reminiscent of Richard Isanove. 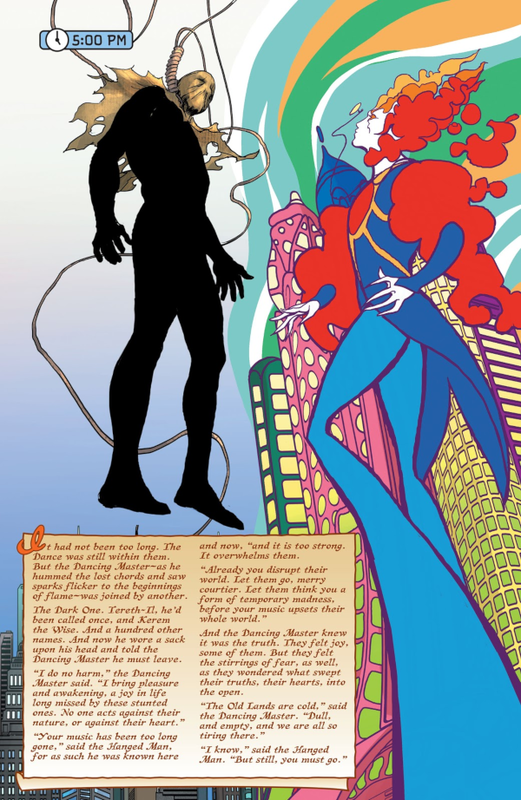 This stylistic change-up means the reader has to stay on their toes and pay attention, one of the many ways in which a comic can demand a reader’s attention or simply let it glide on by, and both Busiek and Anderson have been doing this long enough that their command of readership attention is as peerless as ever. This issue is one long nonlinear sequence of events, as Astro City goes through a typical day, right up until the atypical happens (which is in and of itself typical, but let’s go with it.) There’s bank robbers and super-science and cosmic deities facing off, with some of the most visually interesting art of the entire series. 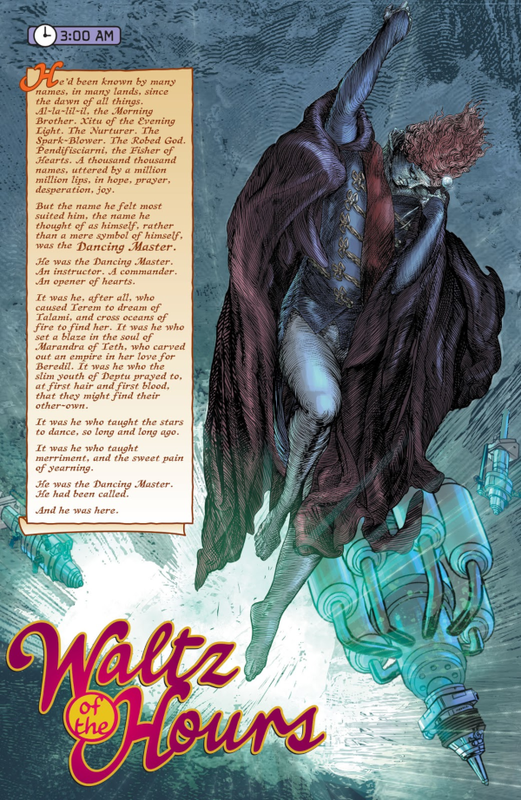 The music that the Silver Adept mentioned gets a dancer to match, which changes everything – for a little while, anyways. Of course, you can read it in whatever order you prefer, once you know the trick. That’s the neat thing about a static medium like prose – once you read it, you can reread it, and skip around at random or with a plan in mind. It’s the same with comics, and with Astro City #13, one of the most unique stories in the entirety of that series’ history. So it should be obvious by now, why I decided to write these paragraphs in reverse order.